Gorgeous bougainvillea vines cover the handsome brown shingled fa�ade. 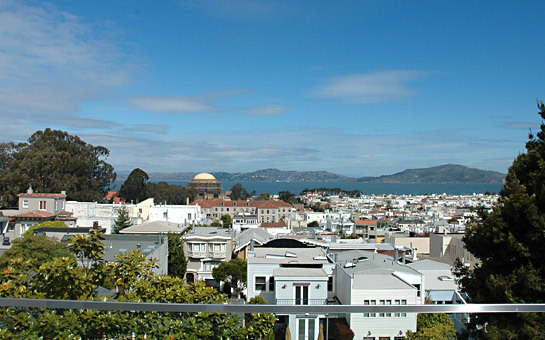 The house enjoys a light and airy contemporary ambience with romantic views of the Bay, including the Golden Gate Bridge, Palace of Fine Arts and Alcatraz Island from three levels. Werner Design Associates worked with the Owner to extensively remodel the residence over the course of 2005-2008 to transform it into an exciting town home suited to chic City living. Topher Delaney, renowned landscape artist, transformed the deep GARDEN into an exquisite contemporary oasis with fire and sculpture elements. The inviting ENTRY HALL features a large skylight at the top of the staircase which allows abundant natural light to stream into the house. The impressive two-story LIVING ROOM features a stone fireplace and tall picture windows showcasing the wonderful bay view. French doors open to the delightful TERRACE with new railing; a spiral staircase accesses the tranquil garden below. Sumptuous velvet drapery with accent mirrors and subdued multi-candled lighting provide a romantic ambience in the DINING ROOM. Practical storage hidden behind dramatic wall treatment. The sunny gourmet KITCHEN features granite counter tops, ample cabinets with glass fronts and island with bar seating. Appliances include: a newly installed professional Bertazonni Euro 48 inch range, commercial ventilator, corner grill, double ovens, Sub-Zero refrigerator/freezer, two newly installed Marvel wine coolers and dishwasher. Step out to the south facing front BALCONY surrounded by bougainvillea and a view of the pretty tree-lined street and cityscape. Gorgeous custom hickory-pecan floors in distressed hardwood have been newly installed throughout the main level for a warm, expansive look. The airy LOFT LIBRARY with stone fireplace looks over the two-story living room to the Bay view. The south facing front BEDROOM with skylight takes in the cityscape of Pacific Heights. A FULL BATH is shared with the center BEDROOM. The luxurious MASTER BEDROOM with fireplace enjoys the Bay view encompassing the Golden Gate Bridge, Palace of Fine Arts & Alcatraz Island. The near seamless view is achieved with the newly installed European-style picture windows and pivot all glass doorway to the terrace, which maximize the dramatic and expansive views. The MASTER BATH has a black granite surround, mirrored vanity, shower and separate WC; the dressing room adjoins. The sunny front AT-HOME OFFICE/BEDROOM features a newly installed custom desk and wall system. Prospective Buyers are advised to review, prior to any offer, the ãSellerâs Disclosure Package" available on request with Listing Agents. The main entrance to the Presidio National Park is only a block away at the Lombard Gate. Enjoy fine dining with guests at Pres a Vi, La Terrase and the Presidio Social Club. Take in golfing, hiking and picnicking among the many activities offered at the park. Enjoy fine shopping and dining at Union & Chestnut Street establishments. THE FAMILY ROOM or AU PAIR QUARTERS has a convenient kitchenette with bar refrigerator and an adjoining tiled full BATH. The two car tandem GARAGE with inside access, LAUNDRY area and additional storage completes this level. A large wine cellar for temperature controlled storage can house an extensive wine collection. The garden can be accessed at this level.